> Progress Software BTA Financial > Application Portfolio Assessment Guide: Are Your Business-critical Applications at Risk? 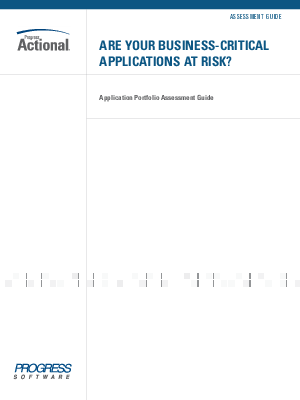 Application Portfolio Assessment Guide: Are Your Business-critical Applications at Risk? This Assessment Guide helps you to create a high-level overview for each business-critical application, detailing the context of the application, highlighting risk factors and overall effectiveness of each application. This assessment, in turn, will provide a foundation for further investigation and actions to optimize the outcomes of your business-critical transactions and mitigate risk.